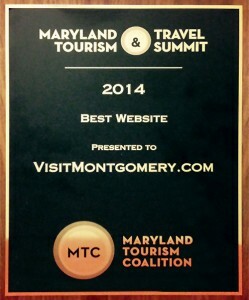 Visit Montgomery Website Wins Maryland Tourism Summit Website Award - Wood Street, Inc.
Wood Street is pleased to announce that our client, Visit Montgomery County, won the award for Best Website and Best Digital Campaign at the 2014 Maryland Tourism & Travel Summit. The summit was held November 12 – 14 in Ocean City, Maryland. The criteria for the Best Website award are that the new website should demonstrate a creative implementation of a brand that is visually pleasing, unique, that captures the spirit of the brand, and is user-friendly. In late August, Visit Montgomery launched the new website, www.VisitMontgomery.com, with updated features like a county-wide calendar of events, interactive map and a trip builder. The website was designed and developed by Wood Street. Additional features like the itinerary and interactive map were created by the app developer CARTONOVA, and the new events calendar was developed by Time.ly. 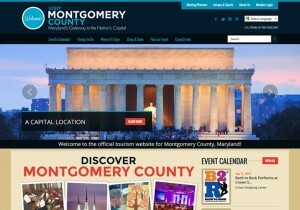 More on the design and development of www.VisitMontgomery.com can be accessed on our portfolio. The mission of Visit Montgomery is to enthusiastically promote, market and sell Montgomery County, Maryland as a destination for meetings, conventions and individual travelers, fostering economic development and benefiting and supporting members and the overall business community. It is Visit Montgomery’s goal to show leadership and be regarded as a quality organization of experts and advocates of its members, partnering with local, county and state organizations and government officials in an effort to further these goals.